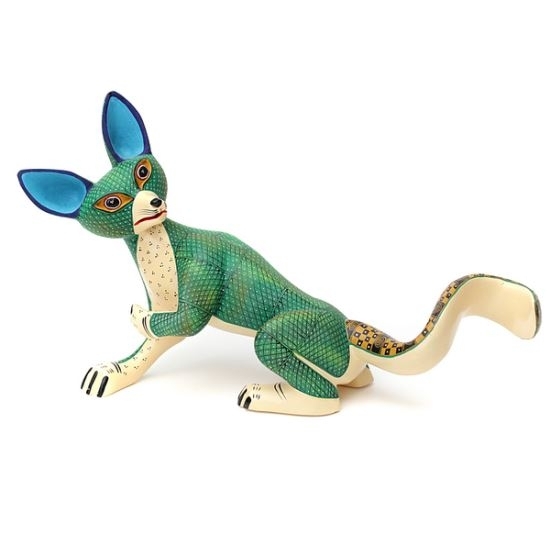 Gervaso is a genuine, one-of-a-kind, hand-carved, hand-painted oaxacan alebrije created by talented local artist Florencio Fuentes from Oaxaca Mexico -- distinctly unique and original. Gervaso the fox on what might be considered a Black Ops Mission. His mother had told him of the new, and large!, shipment of chickens at the nearest farm. She had told him to stay away, for the farmer and his family would be keeping an eagle eye on their new arrivals and she didn’t want anything to happen to him. Gervaso promised he would avoid the farm, but had his rear paws crossed when he told her - - and everyone knows what is said with crossed paws doesn’t have to be adhered to. the choicest and plumpest one of the bunch. This would, he knew, take the better part of the afternoon - - but he also knew the prize would be well worth the time invested. An hour later he had located what he knew would be the ideal reconnaissance point. It was a shallow gully between two small knolls. Open on the end towards the farm, it had the elevation to afford an excellent view of the farmyard below, but offered more than enough cover to allow him to avoid the roaming eyes that kept watch over the chickens. Biding his time until no one was looking his way, he ran all-out until he was on the edge of the ravine and then he jumped, flying headlong into the cover of the gully. It was in mid-air that he discovered he had made a vitally important tactical error, for too late he discovered that the ravine was already occupied. And, his predecessor could in no way be considered friendly! Lying in the very spot where he was about to wind up was Lanky Lobo, the local wolf. Now, it was apparent that Lobo had the same idea he did, and Gervaso knew the fur would fly as soon as he landed on the unsuspecting wolf. Not only were the two obviously competing for the same prey, next to man the wolf is the fox’s greatest predator in the Oaxaca, Mexico area. He knew he had to think fast, or not having any dinner was going to be the least of his worries! He landed hard, and immediately leapt right back up on the side of the ravine. He knew running would do no good, he wouldn’t get more than ten yards away before the wolf would have him. Instead, he chose his wits to his feet and waited for the wolf to respond. Lobo quickly sat up, uttering numerous profanities as he did so. Seeing Gervaso, he just stared at him and slowly began licking his lips. Gervaso knew it was do or die, so he began his spiel. “Oh, I am so glad I found you. I have come to tell you how much I admire you and how I wish I was more like you,” he said with all the sincerity he could muster. “You admire me?” Lobo asked cautiously. “Yes, can’t you see that I am green with envy?” Gervaso asked. “How do you intend to do that?” Lobo asked, his curiosity getting the best of him. Lobo thought for a minute, reasoning to himself that this was a win-win situation for him. If the young fox were successful, he would have both a chicken dinner and a fox for later! If he was not successful, then it would be the fox’s hide peppered with buckshot and not his own. Arries nodded his agreement, and then began the long, slow trip to the farmyard. Using a somewhat meandering route, he knew that Lobo was watching him as he watched the chickens. Before too long he espied the hen he was looking for - - plumb and succulent, she was pecking around the yard not knowing the fate about to befall her. Waiting until no one was looking his way, Gervaso sprinted from his hiding spot, scooped up the hen in his mouth and made a beeline for the brush on the other side of the yard. He knew that now he was far enough away that if Lobo gave pursuit he could outrun him, and that to do so the wolf would have to run past the humans who had already sounded the alarm! Slowing down to a triumphant trot, Gervaso thought that if only Lobo had asked him his name he would have known what to expect, for his mother had named him well when she called him Gervaso el arriesgado - the Risk Taker!